View repository and user information, control your notifications and even manage your issues and pull requests. 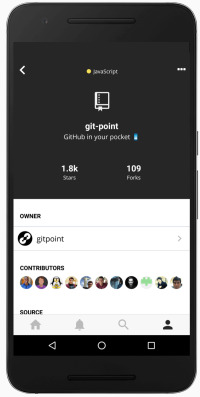 Built with React Native, GitPoint is one of the most feature-rich unofficial GitHub clients that is 100% free. Complete internationalization support allows you to view the app in a number of different languages. Communicate on issue/pull request conversations, apply labels and assignees, and more. With GitPoint, you can even review and merge pull requests with a design you're already familiar with. Every currently available client that I tried to use was either too simple (single-feature), required payment for the most basic of features (such as commenting on an issue) and/or didn't have the best UI. I was pretty suprised that I couldn't find a single client that I enjoyed using, so I built this bad boy with the help of some amazing contributors. When you authenticate your account with GitPoint, your access token is stored in your device with encryption. It's virtually impossible for us to retrieve that information. We never view a user's access token or GitHub data whatsoever. It's not possible even if we wanted to. Nope! Well, not yet :). There are definitely features that still need to be included and you may notice a few bugs here and there. Please take a look at the issue list to see all of the features we plan on adding. Moreover, don't hesitate to file an issue for a bug or a feature request! Yes please! GitPoint is open source and that's what makes it so great. Feel free to put up an issue for anything you notice or a pull request to fix an existing one. Even if you have little to no experience with React Native, we'll be more than happy to help :). Take a look at the contributing guidelines for detailed steps on how you can contribute. 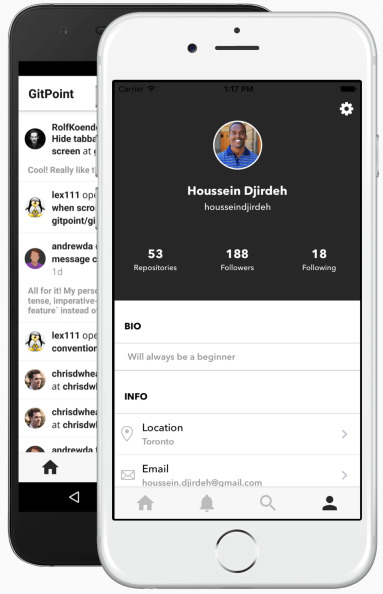 We also have an open gitter channel and we would love to help anyone get started at any time.